This fine show is a very peculiar juxtaposition of Jan Bruegel and his contemporaries with Peter Doig and a group of our contemporaries including Jeff Koons and Sarah Lucas. 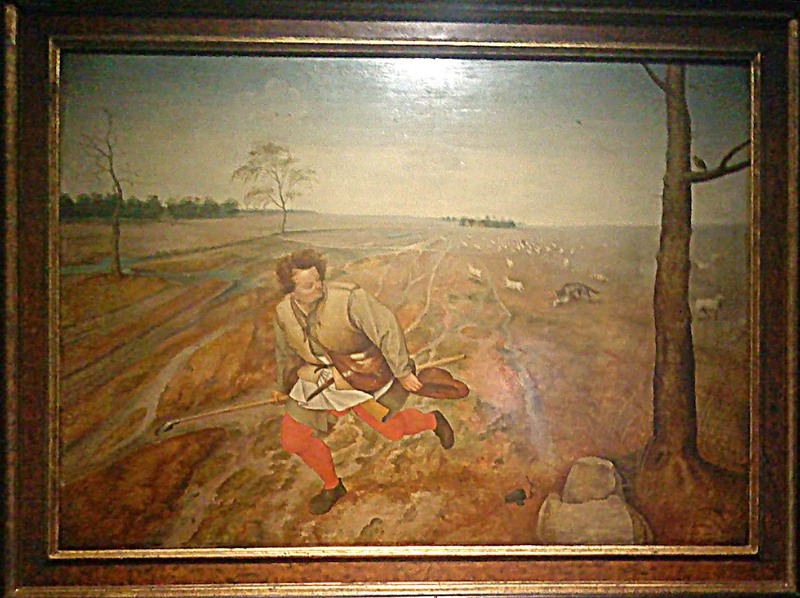 The ostensible link is a moral one – it seems a bit obscure – the ambiguous parable of the Bad Shepherd depicted twice here by Bruegel suggests our choice between freedom and duty. One of those Bible references that means nothing to a modern audience. Well, me anyway. Nonetheless this is an extremely fine collection of high quality stuff. Some of Doig’s best work is on show here -paintings that have travelled widely enough through 20C art to allow themselves the luxury of sensuality and know how it may still be achieved with paint even in the digital age. He has certainly come out of the other side of Abstract Expressionism in the freedom of paint application, Nolde in the fierce colouration, Richter and Polke in the use of photography. Doig does not have the same history to investigate as Richter. His world is not a product of the Holocaust, but of the post-war era. Unlike Polke he does not use photographic imagery in an ironic context. Instead he seems to find it a springboard to create a dreamlike half-memory state that through the floating paint and vibrant colours we can enter and remain suspended in for a moment. That moment is the vital moment of connection – the slim bridge over which all artistic communication travels. 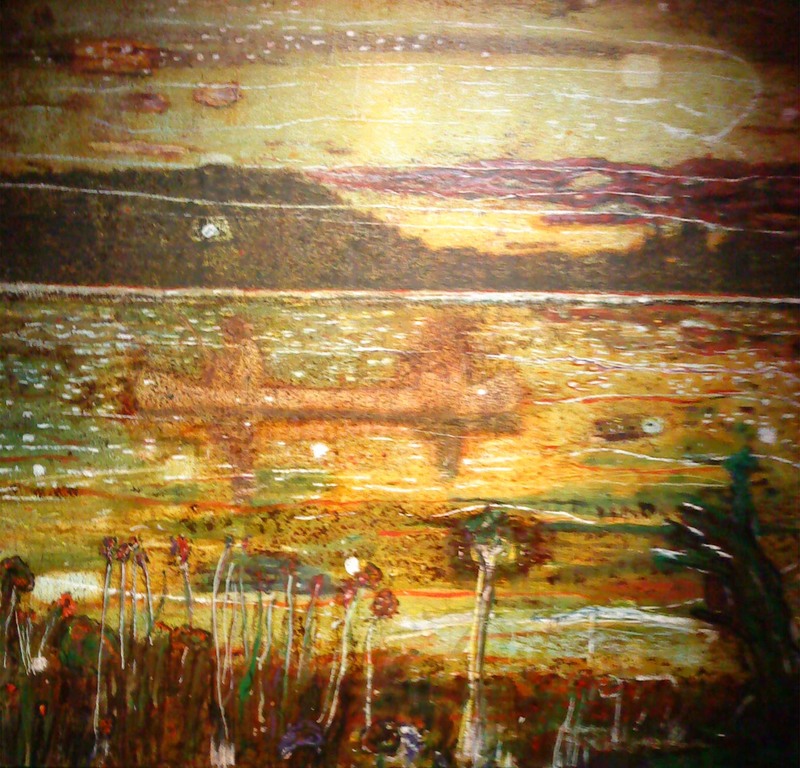 Some of Doig’s earlier work seems complacent and naieve in an awkward way common to a lot of expressionist painting. Some of the more recent work too seems like Schnabel’s a little too assured of its own lovability. But these Night Fishing paintings really hit the mark. To be honest I could barely begin to look at the other contemporary stuff. Sarah Lucas seemed tame. Jeff Koons as ever is utterly pointless. Really there is nothing In any of his work that I have ever seen that I would want to go back to or think about. Even the Cicciolina pictures. I find it hard to see Jeff Koons’ work having any moral to impart and Doig seems similarly blank. But maybe the blind leading the blind is the moral nowadays. Bruegel on the other hand remains fascinatingly morally ambivalent. I prefer the enigma to the painful translation of every element as a symbol favoured by a lot of art historians. I love the way in which he introduced Bible stories into his own contemporary world. The Triumph of Death by Bruegel has been one of my all time favourite paintings since I saw it on the cover of Black Sabbath’s Greatest Hits (The second record I ever bought – because I loved the cover before I had even heard the music) at the age of 13. 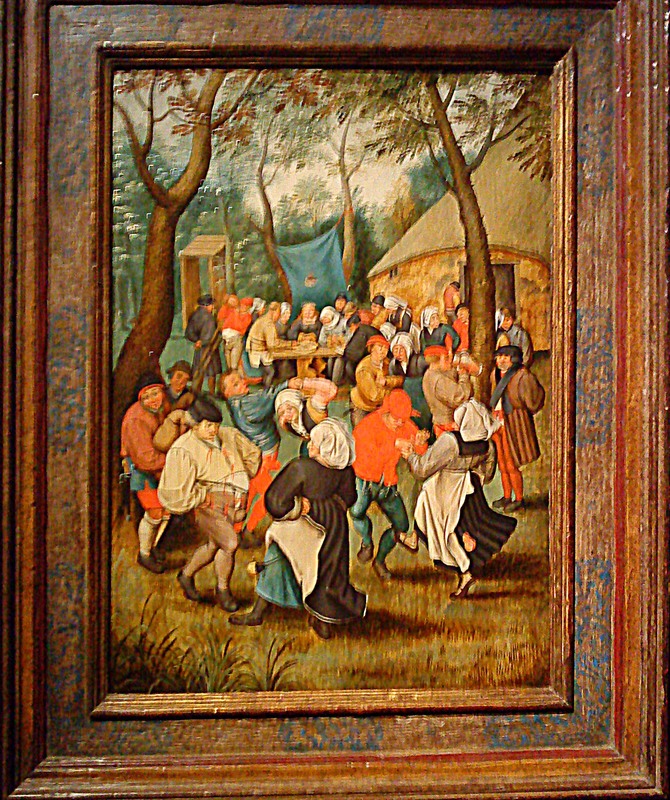 But apparently it’s by Pieter Bruegel (the Elder) and anyway it’s in the Prado, sadly they didn’t have it here. 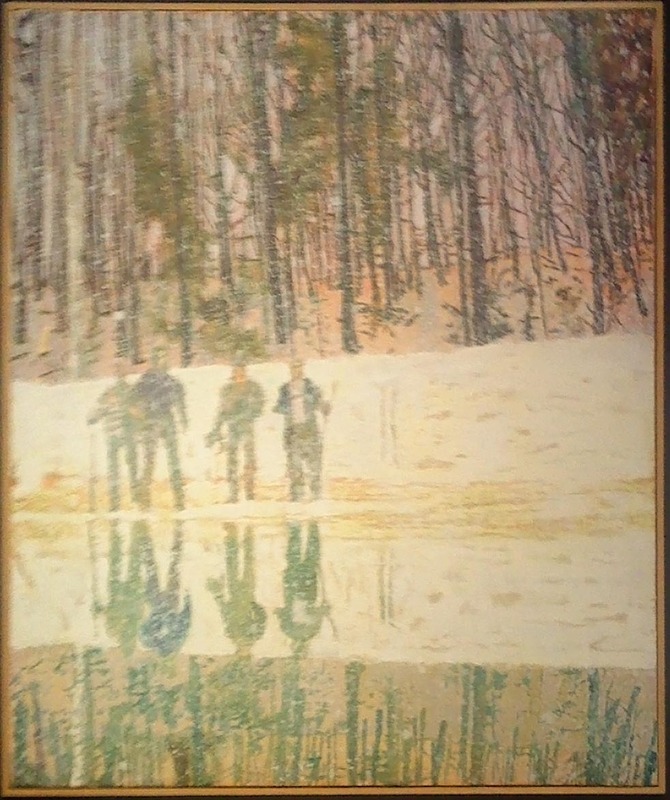 But the themes are also present in his brother’s work albeit less dramatically rendered. He does not shy away from coarseness or brutality (the Massacre of the Innocents is depicted twice here) but there is reflection and sensitivity too. I am so culturally distant from him I cannot apprehend the moral lessons that he might want me to see, and a million art historian’s explanations won’t help me. His composition skills for groups of figures are second to none and his paint has a quality of luminous porcelain – at once solid and delicate. The peasants are happy – drinking, ploughing, slaughtering. The dance of their lives is what holds me. Perhaps the link in the modern work is this unjudging gaze that Bruegel has and the others (perhaps) share. If that’s right, then we are all the peasants now, dancing all to our own strange rhythm. This entry was posted in Art, Contemporary, Galleries, London, Painting, Uncategorized and tagged Art, Bad Shepherd, Bruegel, Brueghel, Christies, contemporary art, Doig, Galleries, Jan Bruegel, Jeff Koons, London, Modernism, Painting, Peter Doig, Pieter Bruegel, Sarah Lucas, West End.